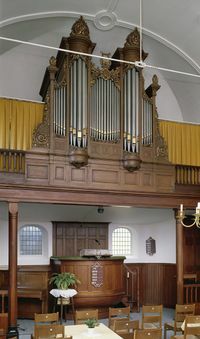 Interior and Organ, Doopsgezinde Kerk, Makkum. A Jan Jacobsz group, sometimes also, though incorrectly, called Old Flemish. This congregation was founded before 1599; for on 22 July of this year representatives of the Makkum congregation were called to Dokkum, Friesland, to settle the dispute between Jan Jacobsz and Pieter Jeltjes. In the early 17th century this congregation must have been rather large; in 1603-1618 Elder Jacob Theunisz baptized a large number of persons here. Its meetinghouse was found in the Wijde Steeg. From about the middle of the 17th century there was a decline: in 1755 the congregation had no preacher and was served by those of Ameland and Baard. 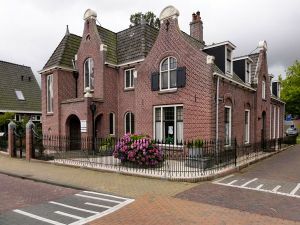 In 1785 the last member of the Makkum Jan Jacobsz congregation died; then Baard and Ameland, the two remaining congregations of this branch, divided the property of the Makkum congregation, each receiving 1600 guilders, and in 1788, when the old meetinghouse was sold, another small amount. A Waterlander congregation, the history of which is entirely unknown. The existence of this congregation is proved by the fact that mention of it is made at the large Waterlander conference at Amsterdam in 1647. It must have merged with the Flemish congregation before 1695. A Flemish congregation, on which there is only scanty information. In 1695, after it had merged with the Waterlanders, it joined the Friesche Societeit (Mennonite conference of Friesland). At this time the baptized membership numbered about 260. Among the first trustees of the Friesche Societeit were representatives of the Makkum congregation, in the 18th century called United Flemish and Waterlander congregation. Of this congregation a book of members baptized since 1690 has been preserved and also a book of births in the families of the members from 1740-1816. In the course of time its membership decreased: 167 baptized members in 1740, 90 in 1808, 115 in 1861, 77 in 1900, 48 in 1957. This decrease is partly caused by the fact that the town of Makkum, like most little towns on the Zuiderzee, declined in the late 17th and in the 18th century because of the wars of the Netherlands with England; also in the 19th century many inhabitants moved elsewhere. A curious circular of 1771 by the church board, in which the members were encouraged to make larger contributions to the church, clearly shows the decline of the congregation. (This letter was published in De Zondagsbode XLVI, 1932-33, No. 33.) Until 1790 the congregation had been served by untrained preachers. The first minister trained at the Amsterdam Mennonite Seminary was Pieter van der Bij, serving here 1792-1814. He was followed by Reitze de Vries 1814-1819, Klaas Ris 1820-1823, H. L. Bauman 1824-1834, A. Doyer van Cleef 1835-1876, J. A. Oosterbaan 1878-1901, F. C. Fleischer 1902-1909, Jacob Hulshoff 1909-1920, P. J. Keuning 1921-1925, and Miss J. M. Eelman 1925-1932. In 1933 the Makkum congregation made an arrangement with the nearby congregation of Witmarsum-Pingjum to be served by the same minister. These ministers were W. F. Golterman 1933-1936, H. P. Tulner 1936-1939, A. H. van Drooge 1940-1946, and Miss S. E. Doyer 1946-1957. The Makkum meetinghouse of the former Flemish congregation was a plain building. About 1850 it was modernized and in 1909-1910 entirely rebuilt (dedicated 17 April 1910). The congregation of Makkum in 1957 had a youth group. In the town of Makkum was found the well-known Dutch pottery owned by the (Mennonite) Tichelaar family. Doopsgezinde Bijdragen (1890): 15-18; (1899): 211; (1909): 186; (1910): 190. Hoop Scheffer, Jacob Gijsbert de. Inventaris der Archiefstukken berustende bij de Vereenigde Doopsgezinde Gemeente to Amsterdam, 2 vols. Amsterdam: Uitgegeven en ten geschenke aangeboden door den Kerkeraad dier Gemeente, 1883-1884: II, Nos. 2089-2092. Loosjes, Jakob. Jan Jacobsz en de Jan-Jacobsgezinden. 1914 reprint: 49 f.
Zijpp, Nanne van der. "Makkum (Friesland, Netherlands)." Global Anabaptist Mennonite Encyclopedia Online. 1957. Web. 21 Apr 2019. http://gameo.org/index.php?title=Makkum_(Friesland,_Netherlands)&oldid=146603. Zijpp, Nanne van der. (1957). Makkum (Friesland, Netherlands). Global Anabaptist Mennonite Encyclopedia Online. Retrieved 21 April 2019, from http://gameo.org/index.php?title=Makkum_(Friesland,_Netherlands)&oldid=146603. Adapted by permission of Herald Press, Harrisonburg, Virginia, from Mennonite Encyclopedia, Vol. 3, pp. 443-444. All rights reserved.